I do not have wheels on my bags, and even when I buy a cart to use, I still use one of the airport carts, they are bigger, taller, easier and comfortable. I carry a few one dollars bills just to deal with the annoying need to pay for them in the USA. I got a free cart to use at the Taiwan airport and a free luggage trolley upon arrival in the Seoul South Korea Airport called Incheon, however really an hour train and subway trip from Seoul. There has been a new world of small gadgets to admire since my arrival to the country of South Korea, this country is really more advance in many ways than the USA when it comes to the manufacturing of items. Then again, most of these products are now made in Asia, so I am at the source. Airport Carts come from great like this free one in the Incheon South Korea Airport to pay to play ones that are broken and the wheel wobbles annoyingly. Notice the strap this cart will securely carry a families worth of bags. Why, when we get off a plane, we do not yet have the local money, and we then either have a very annoying baggage carrier who is corrupt to the gills trying to bug us, or a pay to play baggage carts. Often the first impression of a country is packaged, sealed and delivered at the airport even before the Taxis take their turn. Like I said, I have to carry one dollar bills for months until I return home to the USA just so I can use the too stupid for words pay carts. What is you first impression of the USA. 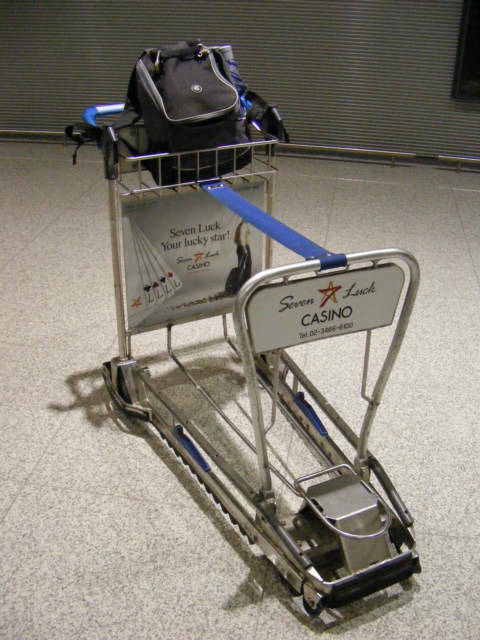 The majority of baggage carts on the planet are free to use and all airports have some type of cart. Many people have the wheels on their bags and this normally works great for short people with one piece of luggage, however when you are a family with children, this carts above says. Airport Carts - New York Times - READ this one, very good comments on carts.